REVOLUTIONARY, THE PR7 IS IN A CLASS OF ITS OWN AND REDEFINES THE ADVENTURE BIKE CONCEPT. IT WAS DESIGNED TO GO FURTHER WITHOUT COMPROMISING RELIABILITY AND RIDING PLEASURE REGARDLESS OF WHICH PATH YOU CHOOSE. Click on the product picture for more detailed pics and specifications. 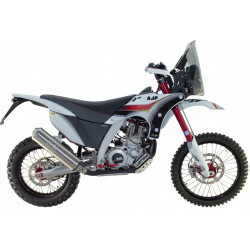 The PR7 is easy to categorize: it is a proper off road bike, light, compact, low center of gravity, but comfortable, capable of good mileage on its 17 litre under seat tank and also designed to carry luggage. Its features include a Cush drive rear hub, titanium header pipes well protected by the HD bash plate, light Shorai Lithium battery, Samsung Android tablet that enables the rider to download their preferred navigational apps. or alternatively follow a route to a destination. The intention of the tablet is to provide a simple and easy to read navigational platform. The tablet has SD card capabilities and can be used with a standard GPS (Garmin, Tom Tom) or offline tracker (OruxMaps, etc). The tablet can also be used as simply a heads up display with speedometer, timer, trip meter, etc, depending on the app. that you load. The tablet also features a handy USB port at the back to enable the rider to charge other accessories. The engine of the PR7 is compact, light and modern, matching perfectly to the intended use of the motorcycle. At the same time an excellent option considering that it is equipped with a balancing shaft to reduce any vibrations (low vibrations) and a 6 speed transmission, allowing for optimal use of the torquey light 600cc single cylinder water-cooled motor, double overhead camshaft, 4 valve, fueled by a modern injected system 45 mm throttle body. Nothing needs to be added to this bike to bring it up to adventure status other than the luggage system that would suit the style luggage you would like to carry. AJP PR7 TECHNICAL SPECIFICATIONS – ROAD LEGAL Type: Single cylinde..
AJP – PR7 Rear Carrier Rack – Marine Grade Aluminium A super strong 6mm thick aluminium carrier r..